The menopause brings big changes — as your estrogen levels begin to drop, not only will your periods come to an end, you may also notice unpleasant symptoms like hot flashes, fatigue, extra hair growth in places you don't want it, and thinning hair on your head. You may also notice that your skin becomes dry, itchy, and a bit flaky. Dropping estrogen levels are, again, to blame. This is because the powerful female hormone also plays a role in stimulating collagen and oil production. As you have less of it, your skin is no longer as good at keeping moisture in. In the five years after you enter the menopause — that means 12 period-free months — around a third of collagen, pretty essential to beautiful skin, is lost, signifying rapid skin changes. Collagen continues to drop after that five-year period too, but much more slowly. Does this mean you're just doomed to have less beautiful skin from now on? Nope! These 15 beauty hacks can come to your rescue. By aiming for eight glasses of water a day and cutting down on things that can make you dehydrated, like alcohol, coffee, and nicotine, you can do a lot of good for your skin. Excessive sun exposure does an awful lot of damage to the skin. Besides dry skin and faster aging, it also puts you at risk of skin cancer and moles. We all know that we're meant to use sunscreen, but now is the ideal time to make sure you actually do. A sun protection factor of 30 or higher with both UVA and UVB proection will help your skin stay youthful and healthy. Remember to use it every day — not just when it's sunny out. 4. What? No steamy showers? Sorry, but no. Really hot showers and baths may help you relieve aches and pains, but they also rob your skin of the natural oils that keep it moisturized. Shorter and less hot showers and baths are better for your skin, and it's also best not to shower too often — definitely not more than once a day (unless you re. Preserve skin's natural oils by scrubbing with soap only in the spots you really need it, like your underarms, feet, and groin. Because your legs, back, and arms don't usually get very dirty, skip the soap and stick to a warm-water wash for these areas. Traditional bars of soap are harsh, and tend to dry your skin out even further. You may want to consider using a mild cleanser with moisturizing properties instead, especially on your face. 7. Break out that lotion — right after the shower! You can lock moisture into your skin better by getting the moisturizer out right after you shower or bathe. Some folks even moisturize while they're still wet! Hyaluronic acid is a great ingredient to fight dry facial skin, while lactic acid or urea will work wonders on the rest of the body. For the truly stubborn dry and flaky areas, there's always Vaseline. Vitamin C, A, and E, and even green tea, all contain antioxidants that will help nourish your dry skin. You can choose moisturizers that contain these ingredients as well as including these vitamins in your diet. 9. Do you need a vitamin D supplement? Your doctor may well advise you to start taking a vitamin D supplement as you approach and then enter the menopause. This is because it helps keep your bones strong, to reduce your risk of osteoporosis. You may not know that vitamin D is also powerful against those menopausal acne breakouts that many women suffer from. You can get special exfoliating brushes for the face and body that will allow you to rid yourself of the old, dead, skin cells you no longer need — pretty important, as dead skin stops your moisturizer from sinking in, leaving your skin drier than you'd expect. Aplha and beta hydroxy acids are also great for exfoliating, but be careful with harsher treatments like microdermabrasion, which have risks as well as benefits. Many women have seen retinol and peptides take years off their skin. That is because they boost your collagen production and in turn make your skin more elastic. You'll find colloidal oatmeal, a great exfoliating product that also hydrates your skin, in many bath products. Oatmeal is good for more than breakfast — taking a bath with this ingredient can help you attain the well-moisturized, itch-free, skin you would ideally like. Stress has a negative impact on many menopausal symptoms, from hot flashes to insomnia and mood swings. It also, as you may have guessed, affects your skin in a bad way, making it more sensitive. Finding a form of stress relief that really works for you, whether it's a new hobby, therapy, or exercising, will do your skin a lot of favors. Like many other medical conditions, your odds of skin cancer also go up as you get older. 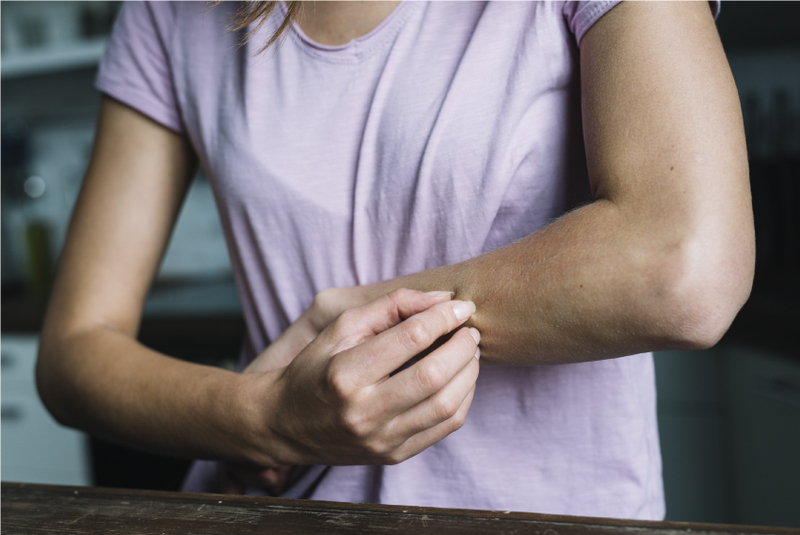 Though many of the skin changes you'll see around the time of the menopause, like age spots, are completely normal and benign, it can sometimes be hard to tell the difference — some skin cancers look quite a bit like age spots. Consulting a dermatologist won't just help you access treatments that make your skin look wonderful, it can also help you spot skin cancer. Timely diagnosis, as always, improves the prognosis. Is the menopause truly to blame for your dry skin? Quite likely, but there are also other possibilities — like hypothyroidism (slow thyroid), fungal infections, and even nutritional deficiencies can cause dry skin. This is why it's good to talk to your doctor (whether that's a dermatologist or your primary care provider) about any skin complaints you have at your next checkup. Hall G and Phillips TJ. “Estrogen and skin: The effects of estrogen, menopause, and hormone replacement therapy on the skin.” J Am Acad Dermatol 2005, 53:555-68. What Can Cause Itchy Hands and Feet? Should herbal creams be used in severe ichthyosis cases? Benzoyl Peroxide WITH Salacylic Acid?